In 2016 Natural Bags were introduced into the Wren range. They were made from paper and had African cow hide leather straps and closing tabs. 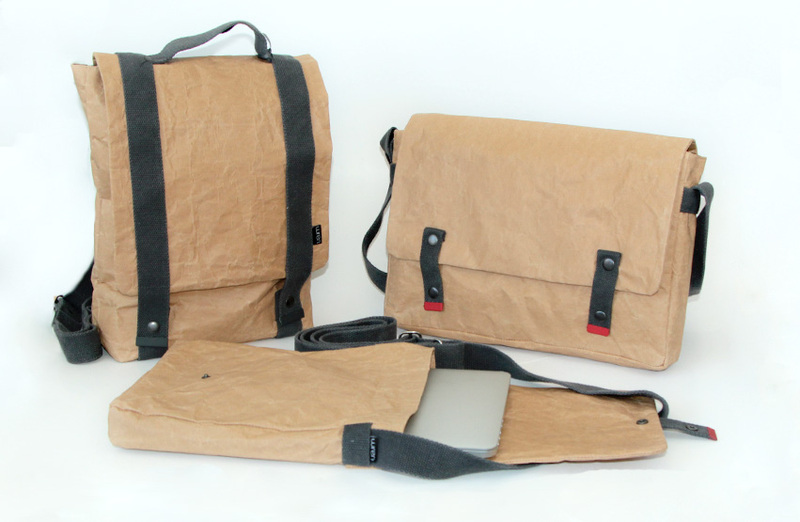 They were called The Natural Leather Messenger Bag and The Natural Leather Sling Bag. This year, 2017, Wren introduces a non-leather version and the brand new backpack! The Natural Cotton Bags are made from the same unprinted brown paper that is collected from the cement sack-printing factory in South Africa. Once at our studio in Cape Town we fuse this “saved” paper to fabric and send this “paper material” to our teams of sewers to make up the bags with strong cotton webbing straps that has been locally dyed charcoal. These new bags tick a lot of boxes. They are vegan friendly, durable, treated with an environmentally friendly coating to be water resistant, made in Africa, just generally happy, made from recycled paper and are handmade. Once the bags are back from our fabulous team of sewers, we do our second quality check and coat the bags. The final touches are the punching of branded press-studs – because details matter – to make sure that the bag closes securely, the attaching of tip ends and finally attaching the tag. This process takes a while and each bag is handled by at least five people who take great care to ensure that at each stage quality standards are adhered to. No seam can be unpicked and re-stitched! There is only one opportunity to get a bag right so it must be done correctly from the beginning. This makes each bag a handmade work of artistry. Features of the new bags include pockets, pres-stud closures (for extra security), double-stitched side shoulder straps, 100% cotton webbing strapping, padded bases and the backpack is made extra strong with cotton canvas fused to the cement-packet paper! Each bag comes with two tip-end options: red or charcoal! This entry was posted in Blog and tagged 2017, backpack, bags, cement packet, cement paper, Ethical fashion, nano paper, natural, paper, recycled, vegan bags, Wren bags, wren design.